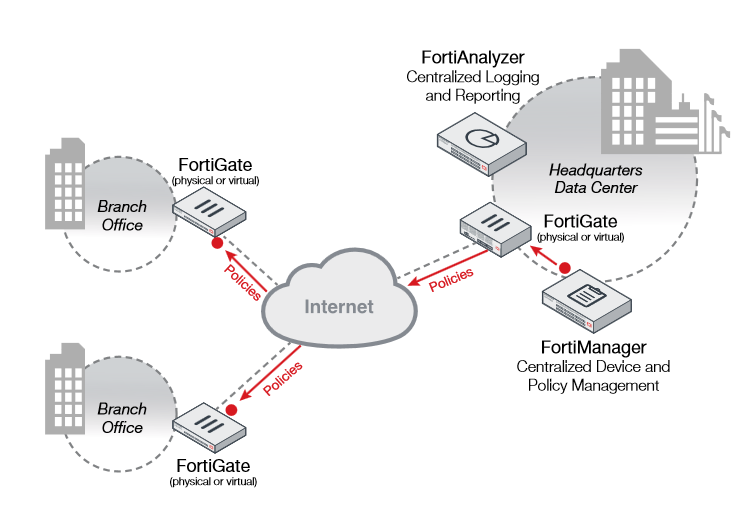 The FortiManager family delivers the versatility you need to effectively manage your Fortinetbased security infrastructure. FortiManager drastically reduces management costs, simplifies configuration, and accelerates deployment cycles, whether you are deploying new devices, installing security policies, or Virdistributing updates. FortiManager also provides crucial timesaving features like device auto-discovery, group management, global policies, auditing facilities, and the ability to manage complex VPN environments. FortiManager, coupled with the FortiAnalyzer™ family of centralized logging and reporting appliances, provides a comprehensive and powerful centralized management solution for your organization. Networks are constantly evolving due to threats, organizational growth or new regulatory/business requirements. Traditional management products focus on mitigating company-wide threats through firewall policies, firmware updates and keeping content security current. FortiManager offers enterprise class features to contain these threats, but also provides flexibility to evolve along with your ever-changing network. In addition to being able to manage hundreds or even thousands of FortiGate devices, FortiManager now includes basic FortiAnalyzer logging and reporting functions for administrators who prefer a consolidated management platform. 1 Each Virtual Domain (VDOM) operating on a physical or virtual device counts as one (1) licensed network device 2 Limited in software to 10,000 devices/VDOMs 3 Storage Capacity and GB/Day of Logs are not stackable. These values represent the maximum available with purchased license.